Big Finish: Doctor Who - NIGHTSHADE Review | Warped Factor - Words in the Key of Geek. Tony tunes in for the adventures of Professor Nightshade. If you line up an elephant and a cheetah, apart from annoying two creatures you really shouldn’t annoy, what you’ll have is two things you can pretty easily tell apart. One’s big and powerful and monolithic, the other’s sleek and fast and evolved to move like a bullet out of nature’s gun. The same is true of Virgin New Adventure novels and Big Finish audio stories. The VNAs were often complex, taking Doctor Who into territory where the on-screen version had been unable or unmotivated to go. Big Finish, after 15 years, practically makes its living going where the TV version never used to go, but such has been the company’s influence that the 21st century show has gone there in a pretty big hurry, meaning Big Finish now explores new areas more or less out of a pure spirit of inventive storytelling, rather than because it’s dragging a show into new areas of subject matter. That said, it’s still the cheetah, telling stories at the performance-rich speed of audio, rather than at the monolithic stomp of novels, which have to denote every thought or movement in order for them to be had. So when Big Finish adapts the Virgin New Adventures, there’s something inherently quite odd about the idea, like forcing an elephant-shaped peg through a cheetah-shaped hole. What emerges on the other end of a successful adaptation usually looks like a cheetah, and sounds like a cheetah, but tastes like it has a solid pinch of pachyderm in its DNA. Big Finish has turned its adaptations of the Virgin New Adventures into something compelling in the audio medium – titles like Damaged Goods and All-Consuming Fire in particular have benefitted from the kick in the pants that translation into audio has given them. So – is the audio version of Nightshade an elephant or a cheetah? Mark Gatiss’ original novel, as was the brief with the VNAs, was set post-TV, and in this case had a Seventh Doctor and Ace who were quite snippy to each other, the need for interesting dialogue on the page being easier to meet if you have characters sniping than if they’re a mutual admiration society. It also of course made perfectly good storytelling sense that these two would have a spiky relationship after the likes of Ghost Light and The Curse of Fenric, as the gameplaying Doctor emerged, who was prepared to use his companions, his friends, as pawns in some greater cosmic game of good and evil. Its story of weird creatures conjured from the imagination of an actor who played a former TV hero, Professor Nightshade, was suitably weird and harked back to some of Tom Baker’s finest, creepiest tales, while adding in a daring, meta-show element in terms of the closeness of the TV Professor Nightshade and the TV Doctor Who. The adaptation, apparently written in close co-operation with Gatiss himself by Kyle Szikora, tampers with the relationship between Ace and the Doctor, making it far less confrontational and rather more ‘early’ in terms of the girlish glee with which Sophie Aldred’s Ace romps about the quiet village of Crook Marsham, bigging up the Doctor and doing solid almost OmniCompanion work as she stumbles over bodies, irritates the bejesus out of scientists, and forms a connection with local lad Robin. While that strips some of the elephantine emotional complexity out of the work, it does also do two important positive things – firstly, it makes it feel much more like a modern Big Finish audio story, zipping along from incident to incident, and secondly, it makes the whole thing much more actively enjoyable as an experience. Losing some of the sturm und drang from the Seventh Doctor and Ace’s relationship allows for the foregrounding of the actual adventure plot, which is a good decision if you’re going to get people to stick with it in the audio format. I’m going to pause at this point to do a happy dance. Because guess who they’ve got to play Trevithick. Only John bloomin’ Castle, that’s who. The Lion In Winter’s John Castle. I, Claudius’ John Castle. One of Britain’s best voices, and an actor who can absolutely hang his hat on the same peg as David ‘Improves Everything He’s In’ Warner. He’s a delight in Nightshade, bringing a curmudgeonly realism to Trevithick, melting into warmer tones and more nostalgic honesty as the story rattles along. Tip for anyone wanting to bolster an audio adventure of any kind, anywhere – get John Castle on the phone. There’s a sackful of praise reserved for Edward Harrison as Dr Hawthorne here too, pitching his performance along a razorblade of positively joyful snark that’s just the right side of assault with a deadly weapon. The scenes he shares with Ace are such dark fun, you almost wish they’d been thrown together more often than they are. The rest of the cast too bring a sure-footed feel to the piece, Samuel Barnett as the would-be Mr Ace and Katherine Jakeways as nurse Jill in particular – the latter standing up to Castle’s curmudgeon and never letting him have it all his own way, while still bringing out the nurse’s caring nature. For all Nightshade zips along though, there are still Gatiss’ bones in the story – the plot refuses to be entirely simple, as it could be at several points, but doggedly pushes on until all its strands get an explanation, even if the resolution to the problem of the threat is a little convenient. There are extra treats in store, too. Given the Doctor’s contemplative mood and his determination in this story not to get involved in spite of himself, we get a kind of in-story Easter egg. There’s a fashion these days to nab Classic Doctors at conventions and make them read New Doctors’ speeches. Here we get the same thing in distinct reverse, McCoy delivering a Hartnell speech with a touching sense of the same man having lived so long, through so many lives. And if that weren’t enough, the joy of audio means we get in essence the reply to that speech that never had a chance to come on-screen, delivered by the only person qualified to do it. All in all then, Nightshade’s got the bones of Gatiss’ story – in particular an interesting story, a couple of really cracking characters and a handful of deeply creepy moments - but it’s also got the punch and the pace of a modern Big Finish adventure, plus John Castle and a handful of solid performances bringing life to what could still be seen as a Tom Baker premise – isolated village, handy observatory, creatures and scenarios being made manifest from the minds of the locals, grisly deaths and something rotten in the basement. Plus the bonus of McCoy doing Hartnell, and in some ways seeding the ideas of Ace’s eventual departure to the Academy on Gallifrey. The resolution is convenient, and the relationship between Ace and Robin, while feeling warm and fun, never entirely convinces as a good enough reason to give up time and space – although of course it’s actually meant to be a thing that’s done when time and space is arbitrarily taken away from you by the retirement of your Designated Driver. 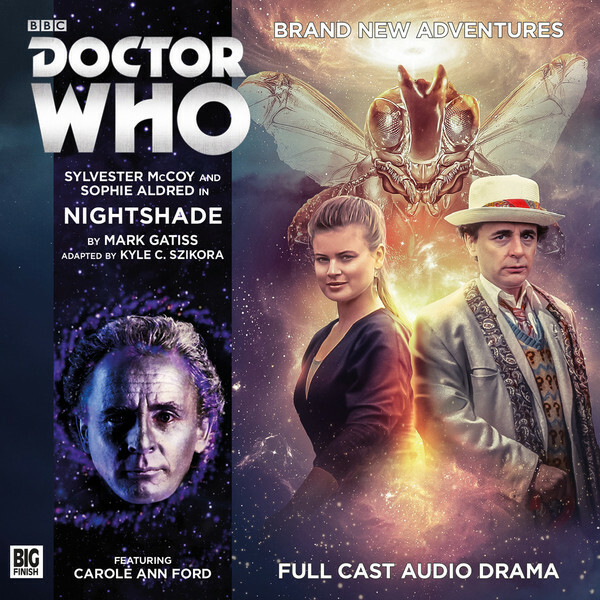 As an addition to the Big Finish range of VNA adventures, Nightshade is a definite goodie, one that’s almost over before you look up, and one to distinctly not miss in the crush of Big Finish releases. Get it in your ears at the earliest available opportunity.